The team at Angelica’s Place has over 20 years of combined experience, and our team has been involved in over 15 communities in Genesee, Lapeer, Oakland and Macomb counties. These communities include independent, assisted living, and memory care. Annual courses from Michigan Assisted Living Association help us stay up to date on various topics, including resident care, activities, medication advancements, team building, nutrition, and more. Our mission is to provide a unique residential setting, outstanding services, and compassionate care—and to do so as affordably as possible. We realize this promise through unwavering dedication to our “resident centered” philosophy, which is based upon each resident’s preferences, and not what is easiest for us. This resident-first approach is what makes our care and communities stand out above the rest. 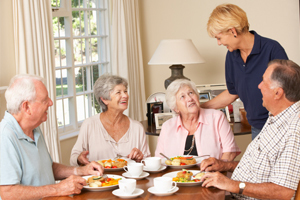 Our communities completely redefine the traditional long-term care facility. We redefine older adult care by taking a 180-degree approach. We understand that “mom or dad’s home”, for them, is a symbol of their independence and a place of privacy. Their home enhances their dignity. It allows them to live their life as they choose. Is it any wonder why they struggle so fiercely to remain there as long as possible? At Angelica’s Place, residents have the means to live their life comfortably, however they please—and they do it at their own pace, to the best of their abilities. When assistance is required, our well-trained, warm, and caring team is there to provide it, no matter what it is or when it is needed. From basic activities of daily living, such as bathing and dressing—or reminders to take medication—we give your loved one, and all of our residents, the help they need and the respect they deserve. Angelica's Place is locally owned and managed to make sure your loved one will be a part of loving, caring family, and not simply a room number. We have the privilege of taking care of one of the most valued people in your life - your loved one. Whether it be your mother, father, husband, or wife, we at Angelica’s understand how important they are to you and believe it is all about team effort when it comes to providing the dignity and care they deserve. We love hearing their stories time and time again. We truly do care and want your loved ones life to be the very best it can be with the abilities they have. Our team loves to laugh, support, and cry with our Angelica’s Family (residents, family, friends, team, and outside providers).